You might think that traditional advent calendars have been around for centuries: after all, the main ingredients (the church’s countdown to Christmas, paper, and candles) have. As it turns out, though, the practice of counting down the days to Christmas in paper form – or indeed, in other ways using wreaths, candles, and buildings – is actually relatively new. 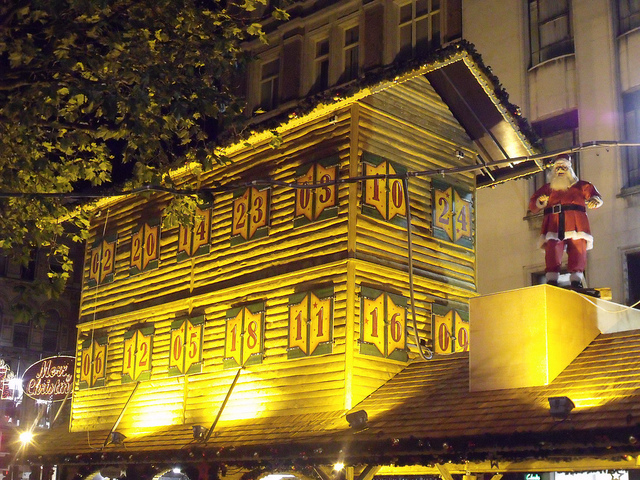 Find out more on the history of the advent calendar. The Scandinavian countries can lay a convincing claim to marking the 24 days of December through to Christmas with candles: julkalendar as these candles are called in Swedish seemed to have originated in Lutheran churches there in the 1700s. And given the fact that huge swathes of Sweden and Norway have already been plunged into perma-darkness for weeks by the onset of advent, it probably shouldn’t surprise us that they came up with the candle idea. Yet the real blueprint for the advent calendar as we know and love it – i.e. with little doors to peel back, revealing candles, illustrations, or (yes, I’m getting there:) chocolate – originates in Germany, that yuletide paradise that also gave the rest of the world the Christmas tree and Christmas markets. While its precursor first appeared in recorded history in Hamburg in 1839 in the form of an advent wreath featuring 24 candles, documented at the Rauhes Haus charitable Christian foundation, there are still debates between experts about whether the first printed advent calendar was also produced in Hamburg in 1902 or in the southern Germany in 1908. What seems beyond doubt, though, was that it was southern printer named Gerhard Lang who came up with the idea of hiding the illustrations behind little cardboard doors, thus giving the calendars their air of slight mystery that keeps children fascinated by them for the whole month. By the start of the Second World War, the tradition of card advent calendars was relatively well established in Germany, and after paper shortages put a temporary stop to them until the late 1940s, they were welcomed back with open arms. 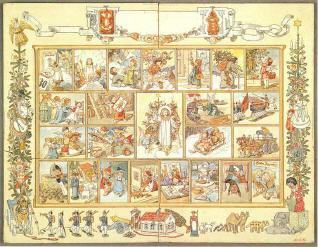 The most popular post-war calendars were produced by Richard Sellmer of Stuttgart (whose company still stocks a wide range of beautiful calendars today), and it did not take long for the product to spread abroad – above all to the UK and the USA, where it has frequently been modified to feature 25 days so that there is something left to open on Christmas Day (for Europeans, this is the first day after Christmas). 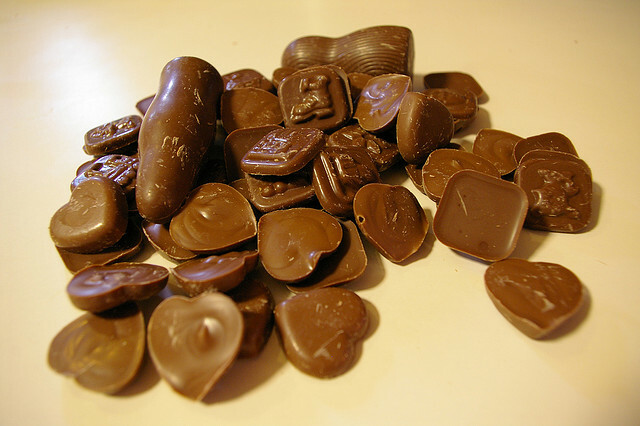 The chocolate advent calendar is also a feature of post-war plenty, dating back to 1958. And although the inclusion of sweet treats in advent calendars has by no means diminished the importance of good design and detailed illustrations, it’s probably safe to state that the chocolaty aspect is the one that interests most children today: indeed, many of the best-selling calendars nowadays are produced by big-name chocolate companies like Cadbury’s featuring their most beloved brands.